Snow Globes and Water Globes! GAAAA! We are SOLD OUT! Sorry folks! Geek Culture offers you some really cool and unique stuff, but we think our waterglobes set a new standard! We are now offering a great kit that you can easily assemble. The kit includes everything you need.. the globe, one set of images for the front and back, glittery particles, and the easy instructions. All you do is add water! The nice thing about this kit is that you can switch the pictures in the globe... even add your own if you'd like! 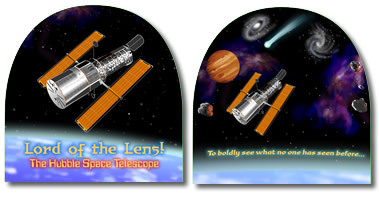 Each globe comes with a pair of Nitrozac-illustrated scenes (front and back), classic and timeless images you can enjoy with wide-eyed geeky wonder. And you can add extra scenes to your order for just 99 cents! Globes are approximately 3 inches wide at the base, by three inches tall. 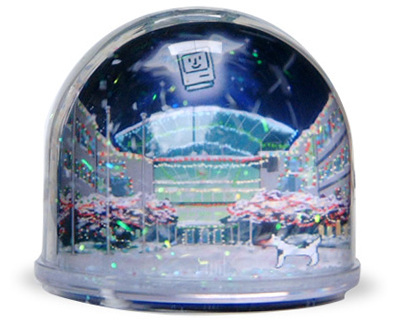 We don't know exactly how many glittery snowflakes we ship per snowglobe, but there is a lot, enough to create a wide variety of snow-like conditions, depending on your snow-globe skills and preferences, since you control the amount you'd like in there! Wow, what a treat for your geek, and what an amazing addition to your geek-o-sphere. Enjoy it all year round, these are treasures you'll find nowhere else! The water globe has never been ... well, just so darn technologically cool! So order right now, ... we can't imagine how you can go through life without one! And yes, you can add your own photos too! Bill Gates playing in money! : This one is a hoot! On one side, Bill's awesome face amid fluttering bills and dollar signs, on the other, Bill frolicks and plays amid his piles of gold bars and cash... no doubt some of it yours! 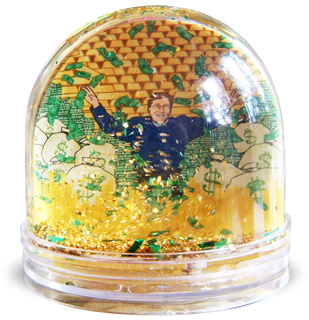 This one is an extra $9.50, as it includes our exclusive gold "coin" glitter and tiny green "bills". Note: As this is a kit, you have to cut the bills yourself with scissors, so this one is challenging to make, and takes some time, but worth it in the end! 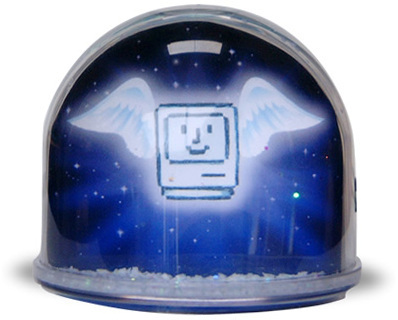 Computer Angel: Featuring Nitrozac's sweet painting of a computer angel, flying angelically amid a flurry of snow-like particles! 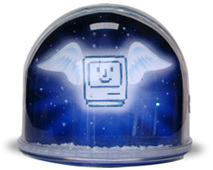 And on the other side, a beautiful illustration of a magical Cupertino Christmas... with the Computer Angel flying above a festive Apple Headquarters. What an insanely great little ball of wonder! 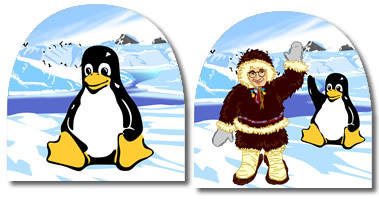 Tux plays in his wonderland, and on the other side his pal Linus visits! Techo Talking Babes: Our lovely and talented TTBs, in swimsuits by the pool, and in their dynamic Super suits! Hubble Space Telescope: Ahhhh, the Lord of the Lens floats over our home planet! 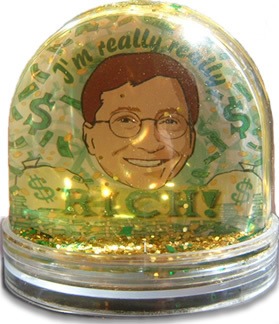 Bill Gates playing in money! Be sure to check out our great shirts and more!